Good news! Practicality hit me again and I've decided to give up buying my dream watch. Before you could read this post, I will be in my home province enjoying the simple life with my two daughters. That's right, I am spending my Michael Kors Runway Chronograph money in a much needed visit to see my grandpa. Instead of saving $250 on that watch which I've been meaning to purchase for Christmas, I gifted myself with this gold Cherie watch plus a short vacation to Romblon. Back to Cherie Paris, I first saw this brand in a duty free magazine while in a plane to Istanbul. 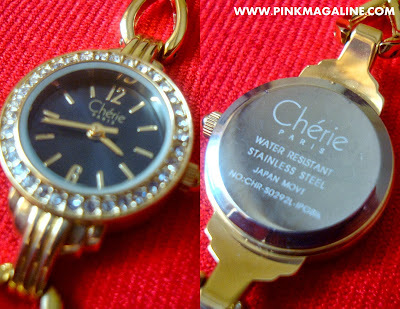 Cherie Paris CHR S0292L IPGBLK.. a perfect alternative gold watch for me. This analog watch by Japanese quartz movement is stainless steel aside from water resistant so it is guaranteed rust free. It is very light, weighing only 0.03 kilogram, functional, very feminine, and can go with with either formal or casual look. I bought this item in Lazada.com.ph for only P2,200. It comes in silver color too. If I were to compare Cherie Paris with other watch brands in the market today, I can say that it is pretty much competitive. Not to mention, watches from this brand are more affordable even engineered with Japanese Quartz movement. I am using this watch more than my Guess and Fossil watches. I love how light it is and how stylish it looks when worn. Will surely recommend this brand to my friends. congrats to your new watch sis, though you haven´t got your dream watch but you able to see your grandpa and that´s priceless right?